On April 26 I dropped Karen off in Lordsburg, New Mexico so she could begin her Continental Divide Trail hike. The road to the trailhead for the CDT is unimproved and not suitable for anything except a high clearance SUV or tank, which my Honda Civic isn’t, so Karen would have to take a shuttle to get to the trailhead. The shuttle is sponsored by the CDT Coalition and transports hikers to the trailhead from Lordsburg several times a week during hiking season. The trailhead itself, at the Crazy Cook Monument, is on the New Mexico and Chihuahua, Mexico border. The monument was named after a cook who apparently killed someone at or near this spot in the 19th century. After dropping Karen off I started driving east through New Mexico on Interstate 10, the southernmost transcontinental highway in the American Interstate Highway System, running from California to Florida. I was in a hurry to get to Texas and I had a long drive ahead of me, so my birding was limited to what I could see from my car. The habitat on this drive was fairly monotonous, and except for Turkey Vultures, White-winged Doves, Western Kingbirds, and ravens I didn’t see much in the way of bird life. Just after I entered Texas from New Mexico I saw a sign on the side of the road that read “Beaumont 840 miles”. Beaumont is at the other end of Texas and my heart sank a little as I realized I would have to drive every one of those 840 miles to get through it. I’ve driven the lengths of North and South Dakota, Nebraska, and Kansas, but driving from one end of Texas to the other would make driving those other states seem like a walk across the street. The birds in western Texas were similar to what I had just experienced driving through New Mexico, i.e., Turkey Vultures, White-winged Doves, Western Kingbirds, ravens, and not much else. Near Fort Stockton I started to see Cave Swallows flying around highway bridges. I hadn’t seen Cave Swallows in a long time so this was a treat. At one bridge a swarm of Cave Swallows came pouring out in protest when I started pishing. Who knew that pishing would work on swallows. Just east of Sheffield I checked a canyon mentioned in “A Birder’s Guide to the Rio Grande Valley” that was supposed to have Gray Vireos. After a little exploring I heard a Gray Vireo singing and after a foot chase I saw the bird reasonably well. Gray Vireo was another bird I hadn’t seen more than a couple times so I was thrilled, even if the look wasn’t stellar. 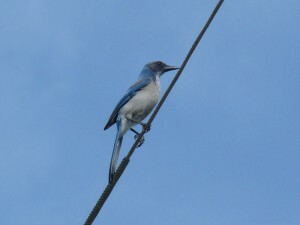 On the morning of April 27 I birded Lost Maples State Natural Area near Vanderpool. Lost Maples is a gem of a birding place and turned out to be one of the highlights of my trip. I haven’t been to Lost Maples in a long time so my memory of it was foggy at best. As I drove into the park I rolled my windows down and was overwhelmed with a dawn chorus of birds as impressive as any dawn chorus I’ve experienced in the Midwest. Dominant were White-eyed Vireos, Indigo Buntings, Blue-gray Gnatcatchers, and Summer Tanagers. I also had Eastern Wood-Pewees, Ash-throated and Acadian Flycatchers, Carolina and Canyon Wrens, Hutton’s and Yellow-throated Vireos, and Blue and Western Scrub-jays, for a nice mix of eastern and western birds. I heard far more than I saw, which is typical of most dawn choruses. The star attractions of the park however are the Black-capped Vireos and Golden-cheeked Warblers that nest almost side by side. I heard 7 or 8 Black-capped Vireos but saw only 2. They really are shy little birds and if they don’t want to be seen they won’t. I had better luck seeing Golden-cheeked Warblers, and a pair actually came in to investigate my pishing. I also had a Zone-tailed Hawk, a bird I missed in Arizona. Wonderful place, Lost Maples is. After Lost Maples I took a spin through the Texas Hill Country on my way to San Antonio. There were lots of Scissor-tailed Flycatchers, Western Kingbirds, and Northern Mockingbirds along the roadside, and several Crested Caracaras flying around. Fun birding. This entry was posted in Non-Montrose Birding on September 26, 2014 by rhughes. Montrose was very birdy this morning, September 26. I hadn’t been there in over a week but I was impressed with the number of warblers around. Dominant among these were Tennessee, Blackpoll, Yellow-rumped, and Palm. I also had a couple of Northern Parulas and a male Black-throated Blue Warbler, all in the Magic Hedge. Other birds of interest this a.m. include my first Hermit Thrush of the season, a flyover American Pipit at the beach, a calling Sedge Wren in the dunes, and 5 flyover American Golden-Plovers at the beach. I didn’t have any Nelson’s Sparrows in the dunes but this is prime time for them. This entry was posted in Fall Bird Reports and tagged American Golden-Plover, American Pipit, Best Fall Migration Days, Black-throated Blue Warbler, Pipits, Sedge Wren, Shorebirds, Warblers, Wrens on September 26, 2014 by rhughes. Black Tern – 1, the juvenile from yesterday. Seen early in the morning only. All of the swallows were seen together. They were feeding over and around the pine trees near the lake. This entry was posted in Fall Bird Reports and tagged Baird's Sandpiper, Best Fall Migration Days, Black Tern, Connecticut Warbler, Philadelphia Vireo, Shorebirds, Terns, Vireos, Warblers on September 13, 2014 by rhughes. 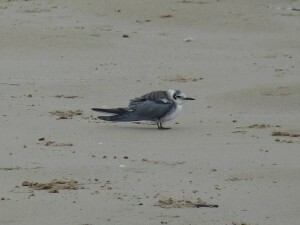 I had a juvenile Black Tern at Montrose Beach this afternoon, September 12. The bird was standing on the beach a couple hundred yards west of the protected area. Black Terns are rare at Montrose and I don’t know if I’ve ever seen one standing on the beach. I also had about 50 Sanderlings, 3 Black-bellied Plovers, and a Spotted Sandpiper. This entry was posted in Fall Bird Reports and tagged Black Tern, Terns on September 12, 2014 by rhughes. 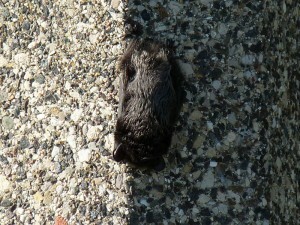 I’ve been seeing migrating bats at Montrose for the last few weeks now. This morning, September 7, I had about 10 come in off the lake while I was standing at the east end of Montrose Beach. A couple landed on the light tower but most continued flying south over the beach and dunes and landed somewhere in the wooded area of the point. This is fairly typical behavior. Since I can’t identify bats in flight I have no idea which species I’ve been seeing, but most fall into 2 categories – large with dark underparts and small with pale brown underparts. In the past the local Peregrine Falcons would perch on the light tower at this time of the year and predate the bats as they were coming in off the lake in the morning. For whatever reason they don’t do this anymore. This morning I found a bat that I believe is a Silver-haired roosting on the side of a concrete light pole at the south end of the beach. A more thorough search of the point would almost certainly turn up more. 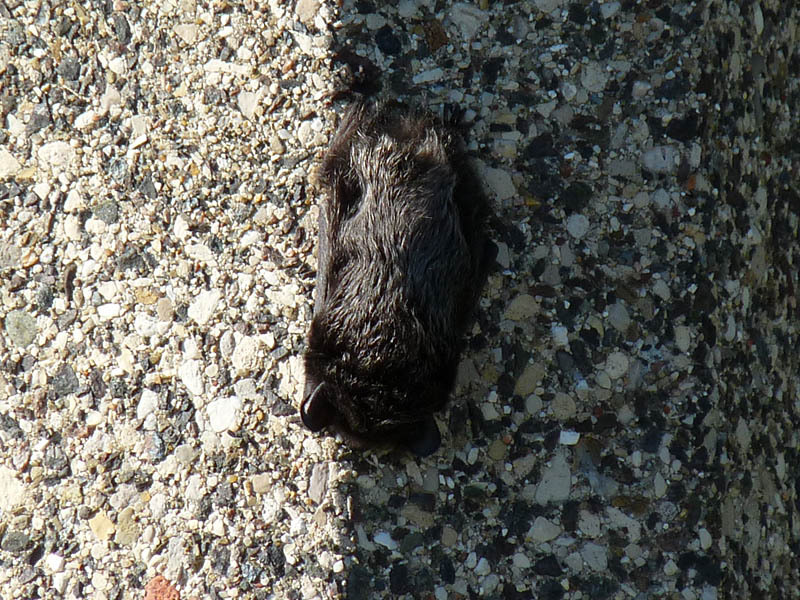 This entry was posted in Fall Bird Reports, Other Wildlife and tagged Bats, Mammals on September 7, 2014 by rhughes. 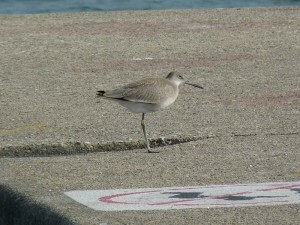 A juvenile Willet was at Montrose Beach on September 4. I first saw it on the beach just outside of the protected area but a jogger came along and the bird flushed and landed on the end of the fishhook pier. It’s getting late for Willets. 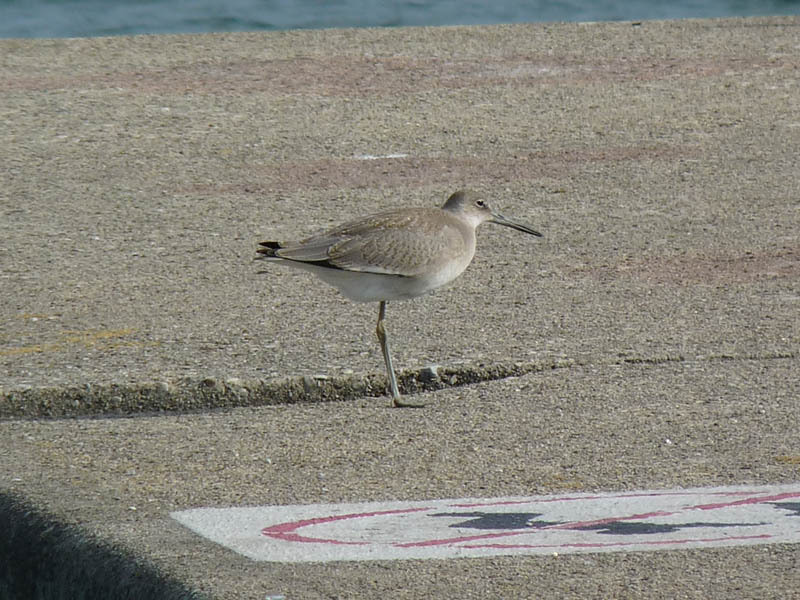 This entry was posted in Fall Bird Reports and tagged Shorebirds, Willet on September 5, 2014 by rhughes.